Nifty Future lost last three days gains. 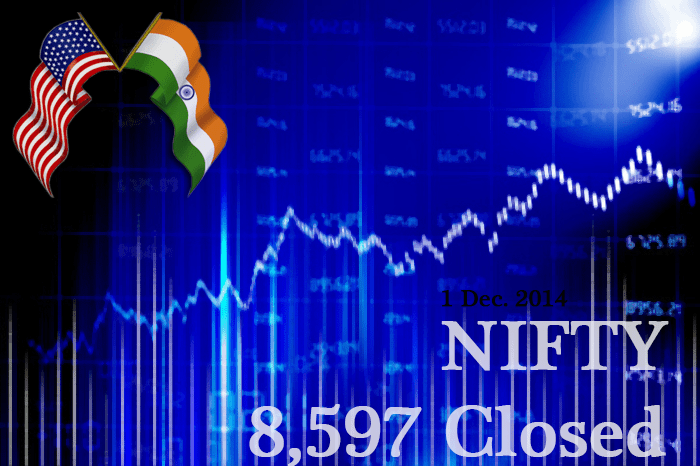 Nifty Future Dec. is declined 8,597.50 and -27.75 down points (-0.32%) cause of RBI policy. U.S. stock futures fell Monday and Asia markets diverged as investors returned in earnest from the Thanksgiving Day holiday. Hong Kong’s Hang Seng index plunged 2.6% as police used pepper spray and clubs against protesters demanding democratic reforms in the semi-autonomous Chinese territory. In Tokyo, the Nikkei 225 index rose 0.8%. After markets closed there on Monday, Moody’s downgraded Japan’s sovereign debt. In mainland China, a manufacturing survey showed activity weakened in November, adding to signs an economic slowdown is deepening. The Shanghai composite index traded flat. Dow futures fell 0.5%, S&P 500 futures declined by a similar amount and Nasdaq futures were down 0.3%. Wall Street stocks ended mostly lower Friday.